It comes as no surprise that business owners are choosing Bossier – one of the fastest-growing cities in Louisiana. New businesses range from wrestling – BBQ combinations to axe throwing (yes, axe throwing) and well-known franchises to family-owned startups. The New Year is already showing signs of this trend continuing with a variety of new businesses opening their doors. Here are a few Bossier Parish businesses to enjoy in 2019. It started as an ongoing joke between two Bossier City natives. The dated “Uneeda Biscuit” building in downtown Shreveport became inspiration for a business name with husband and wife team Danielle and Joey Trejo. The play on words are what the two used to name their highly successful taco truck, Uneeda Taco. Owner Danielle mentions why the pair felt a brick and mortar location was their next step in business. “We needed more stability with our income and we also felt that we could do well here because the food truck always did so well here. We noticed that the residents here would stand in the hot sun or even cold rain to get food from us, which always blew us away,” she says. Trejo says what sets them apart from other Mexican restaurants is the wide variety of tacos on the menu as well as their homemade sauces. They especially take pride in their special taco with jerk chicken and pineapples. As for the name, the “Need” in Uneeda also doubles as part of their business mission to give back by donating food to local ministries twice a month. 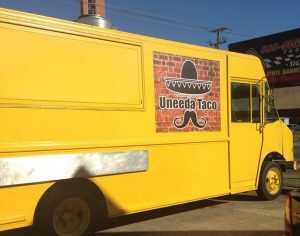 Uneeda Taco on Airline opened for business in December 2018. The Dental Studio is a dream come true for Bossier native and business owner, McKenzie Holloway. “I always wanted to own my own dental practice since I was in middle school,” she says. The business offers everyday dental services from cleanings to root canals but also Botox to teeth beautification services including veneers to implants. The Dental Studio opened for business January. What do you get when you mix a super comic fan with a lifelong love for dogs? Dogwarts. The play on words from the wizard school Hogwarts in Harry Potter was the inspiration behind this dog daycare and boarding business. The father-daughter team takes pride in fulfilling a dream. Cowan was raised in Texas and now calls Bossier home. “We looked at many different surrounding areas such as Shreveport, Greenwood and even Waskom, Texas. Bossier, however, was closer to some of the clients that I have previously worked with while caring for their fur babies,” she says. Dogwarts Daycare and Boarding started accepting new four-legged clients in January. This Louisiana based company has more than 100 locations. Brandy Craft is a new franchisee of the chain. 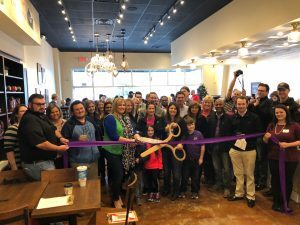 This is the first PJ’s Coffee location for Bossier. The husband and wife team purchased the franchise in October of 2017 and celebrated their Bossier opening with a ribbon cutting ceremony in January 2019. Craft’s love of coffee began at a young age. Craft is native to Louisiana but only became a resident to Bossier Parish five years ago. She says she became frustrated that her only coffee option was Starbucks so she would order PJ’s online in bulk to have the taste she craved. This, along with her lifelong dream to own a business, made opening PJ’s the perfect combination. “I graduated with a Business Administration degree knowing that one day I would do whatever it took to own my own business,” says Craft. According to Craft, their most popular item is Granita or Southern Pecan coffee. Craft currently resides with her family in Benton. Wrestling fans get ready, the King is coming to Bossier Parish! Famed wrestler Jerry Lawler has given local business owner, Michael Pierce, the blessing of being his newest franchise owner. Pierce is a transplant of 20+ years after serving in the Marine Corps. He was led to Bossier for love and worked 19 combined years for the Bossier City Police Department and the Bossier Parish Sheriffs Office. As a retiree from a career of serving the public, he’s excited to engage the public in a different way. The restaurant and all its decor is said to make you feel like you’re in the ring. From the steel chairs to the Slamwich’s offered on the menu. “This is definitely a good fit for me. I was a huge wrestling fan as a kid so opening this franchise rekindles a lot of good memories,” Pierce adds. 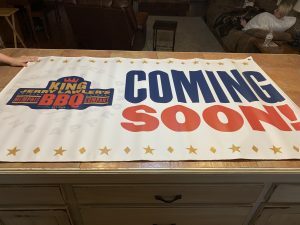 Jerry Lawler’s Memphis BBQ is on schedule to open its Benton location in mid February. Pierce says an appearance by “The King” himself is planned for the grand opening. Have you ever thought about throwing an axe for recreation? Maybe in a league? For two Bossier couples, the sport was infectious. Goodman says the entire ride home from Dallas in July 2018, the couples discussed opening their own axe throwing business – and acted quickly. “Once we got back into the area we didn’t even go home. We just drove around looking at potential buildings,” she says. But the perfect location was in a growing area of Bossier City. As the 20X49 blog’s Chris Jay reported in December, the Bayou Axe Company will be located next to BeauxJax Crafthouse. Goodman says they also took the walking traffic and open-carry law into consideration when choosing their location. One thing Goodman wants to make clear is the business is not a bar and compared it to a venue like a bowling alley or batting cage. She says there are ten lanes and arcade games. The environment is more structured and safe than some are lead to believe. Even though they’re not a bar, alcohol is not off limits. Goodman explains customers are welcome to bring in alcoholic beverages from businesses within the district and eventually they will have their own liquor license. Anyone is welcome to bring their own axe, host parties and enjoy live music on Friday nights. Bayou Axe Co. will open within the first two weeks of February. Main Squeeze wants to be your “main squeeze” when it comes to cold-pressed juices, acai bowls and superfood smoothies. This fairly new and quickly growing franchise built their first store in Lake Charles, LA in 2016. There are now dozens of locations across south Louisiana, Texas and now its first north Louisiana store in Bossier City thanks to husband-wife team Kurt and Caroline Nixon. Main Squeeze will open sometime in March 2019. Call Center that helps guide parents through the child support system and help find resources to provide financial, medical and emotional support to their children. They’re bringing 80 new jobs to the area. Risen Rock Climbing Gym is coming soon in March 2019. I would love to send you information on our new family friendly Bossier business.